A handful of old coins, dating from the 1930’s and on. I thought it good to buy back my spontaneity with these coins. Lately I could feel myself working very tight, very meticulous and aiming to “do it right”. So when I threw these coins on the table, I bought back my freedom. 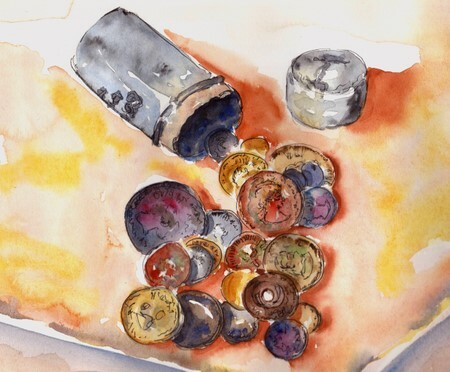 There are many irregularites in this painting..a too dark inside of the silver canister, funky pieces, the colors are wild and it may look more like candy than money, but take my word for it…coins they are. Rusted within a broad spectrum of colors, I could do nothing less than paint a caleidoscope, for therein lies my freedom. That is beautiful! I’d never have thought it was possible to make such a lovely, colourful painting of a handful of coins. Wonderful! GORGEOUS, RONELL!! I LOVE THE PAINTERLY, WASH LOOK TO THIS — COLORS, STYLE — CHARMING!!! Everytime I visit I’m aways in awe at the amount of work you’ve produced. And it’s always such great quality. This is GORGEOUS. I’m blown away by your use of colour – especially in this one. Oooh I’m jealous too! I just love your use of color — how fantastic this painting is! It just jumps at you! I like the juicy, wet watercolor look you have. I like what you wrote about the coins too. Such a wonderful compostion and use of color. Just perfect! Beautifully warm and sensuous. It is interesting to think about where those coins have been isn’t it. Great job on the coins, I love the colors. I have a bag of coins from China that my mom brought home when she traveled there when I was a kid. I might need to dig those up! I really really like the loose style on this and the colors. This was a success in my opinion!! Well done on reclaiming your freedom! I love this colourful spontaneous painting. Oh Ronell these sign with life and vitality – I love the free you!! WOW! A rainbow in a bottle. Funnily enough I always think of you as a rainbow of colour so this sketch explains you perfectly to me! eautiful job…but what else would you do? I can smell the musty,rusty coins! Beautiful hues..
Congratulations on winning back your freedom….a beautiful and colourful sketch, Ronell! I love it!! Hi Ronell – we’re back – I’ll call you soon! You’ve been dong some lovely work while I was away. Has Sandra seen her portrait? I’ve missed our art days – we’ll have to do it this week. Wow, who knew coins could be so colorful. I really love this painting, you have achieved a beautiful loosness and spontaneity. They undoubtedly look like coins, only so much beautiful than ordinary coins! I love it. Gorgeous pigments laid down wonderfully loose! I really love the way you just let the paint flow on this, who knew coins could be painted in such as interesting way. Oh, I know those periods of tightening up! You’ve found the perfect antidote! Lovely, Ronellesque coins. I need to make a plan for a rendez-vous with you and Casey in September! I love your use of color. It’s one way to take a usually mundane subject and spice it up. This is beautiful! This is beautifully luscious – what a delight. Ronell, I also like the random placement of the coins. They look beautiful in the colors they’ve evolved to. I’m glad that you’re able to retrieve your freedom.